Ok, I think you can officially call me your blog stalker lady...... I squealed when I saw you had a new post....... I know...I really need to get out more. I have never ever tried panzanella and have always wanted to !! This is being printed as I type and hopefully I can post about it and link back to you next week. This salad is so beautiful and looks so tasty. I really HATE being allergic to tomatoes! I can't wait to try this version! Ina's Panzanella is one of our absolute favorite things. We have it all the time. The greek flavors are superb, I bet. We make her regular Panzanella all the time..summer or winter. We need to try the Greek version. Looks great! Queen- I hope you love it- it's easy and so delicious I ate two whole platefuls, lol. Jennifer- I can't believe you're allergic to tomatoes, that's horrible! My husband can't eat them because of some stomach issues but I still make them for myself occasionally. I'm sure this would still be tasty without them, though! Oh! I saw her make this the other day on her show! Looks wonderful, I've never had panzanella before. Once I discovered English cucumbers a few years ago, I've not bought any other kind of cucumber - so good! Oooh, good tip on cutting the tomatoes! This does look good, and no boring lettuce, LOL. So glad to hear what you had to say about this- I saw her make it recently. I wondered if I would like it better than her old panzanella recipe. In fact, I had panzanella a couple days ago in a restaurant and they only used heirloom tomatoes, the crusty croutons and a vinaigrette. I like more "stuff" in mine. I thought the exact same thing the first time I made panzanella. I love it. A greek version sounds tasty. I have never heard of the lid thing for cutting tomatoes but that is such a good idea. That is such a good idea. Reading that is definitely the highlight of my day. Admittedly a pretty rough day but still the best part of it by far. Anne, your food always looks so good :) I have something I think you will really enjoy. It is a new show on the Food Network called "What Would Brian Boitano Make?" First of all his food looks like it would be soooo yummy (who knew he was a cook?). Second, the guys is hilariously entertaining. If you have the Food Network, check it out. This looks incredible, Anne! 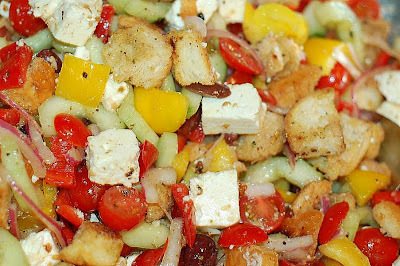 I've been eyeing Ina's panzanella for a while; now I know that I have to make it immediately. The salad is beautiful, and who needs all that boring lettuce, anyway? YUM. I made this tonight, and it was YUM! The fam died of YUM. :o) And I accidentally didn't have any red wine vinegar, so I used white balsamic, and it was still so YUM! And my feta was Rawlins, WY feta, but the salad was still so good. So, I can't even imagine what yumminess would be involved if I had all the fancy schmancy stuff!